Every time I go to High Falls Lake, I am reminded of what a great fishing spot we have close to Griffin. The lake is very quiet since motors are limited to 10 horse power and there are no skiers, skidoos or run-abouts there. And the fishing is excellent. Jim Berry and I went there last week to try to find some bedding bream. We were disappointed, the few beds we found had only small bream on them. We caught a good many fish, but most were not at big as what we were looking for. On Friday I talked with Keith Weaver, the state fisheries biologist that keeps up with High Falls. He told me this was a strange bedding year for all species of fish because of the unstable weather. Bream usually bed on the full moon but the cool mornings last week may have delayed them some. They might be in full bed right now. Keith said High Falls has an excellent population of bluegill and you should be able to catch a lot of fish in the half-pound range. That is a good size for lake fish. I have been spoiled catching 12 to 14 ounce bream in my pond, but I feed them every day. Lake fish don’t have it that easy. There are a good many shellcracker in High Falls, too. Keith says they are probably done bedding by now and you could catch them along the old creek channels in 5 or 6 feet of water, especially in Watkins Bottom. He also told me the bigger bream would probably come from the deeper water nearer the dam and up in Buck Creek. Jim and I met Tommy Lance at the boat ramp as we loaded my bass boat back on the trailer. He said he did not know you could put a big boat in the lake, but we told him it was ok if you did not crank the big engine and used only the trolling motor. If you put a boat in with a motor over 10 horse power and crank it, you can just about bet a game warden will be waiting on you with his ticket book before you leave. Tommy said he caught a lot of big bream up the river near the area called the Duck Pond, and in Buck Creek. He said those were good bedding areas. All this information will be used in a June Georgia Outdoor News article I am working on. Bream should be bedding now at High Falls. Grab a bucket of crickets, a tub of worms and your light fishing stuff and head to High Falls to catch some fine eating, hard pulling bream. This entry was posted in Bream Fishing, Where To Fish on March 17, 2019 by ronniegarrison. Montgomery and is between its more famous sister lakes, Jordan and Lay. The lake is basically a river with its dam on the headwaters of Jordan and ends at the Lay dam. There are several big creeks feeding it and its shoreline is lined with rocks, docks, grassbeds and wood cover. Big Coosa River spots live in it as do big largemouth and it is a fun lake to fish. Auburn has 42 members on its team and is one of the best teams in the nation, producing several pros, including a Bassmasters Classic winner, over the past few years. Cameron has finished high enough within the team to make the top 12 travel team. We had a good day, catching a few spots although the big ones we hoped for did not hit. The skills and knowledge of college fishermen constantly amaze me. I have been bass fishing all my life and competing in clubs for 43 years, but many of them are much better fishermen than I am. Mitchell is about three hours from Griffin, but it would be a good weekend trip. There are several motels about ten miles from the lake on I-65 and plenty of places to eat in the area. This entry was posted in Bass Fishing, Where To Fish on March 1, 2019 by ronniegarrison. A couple years ago, I met Matt Justice at Lake Hartwell to get information and pictures for my October 2016 Map of the Month article in Georgia Outdoor News. Between trips there I often forget it is only a little over two hours away, depending on traffic, and it is a beautiful lake with clear water and full of largemouth and spotted bass. I left at 3:30 AM to meet Matt at 6:30 AM since I hate to be late. It was a good thing I did. I made it about 40 miles up I 85 north of Atlanta quickly since there was fairly light traffic that time of night. I was surprised at the number of vehicles headed north toward Atlanta, even at 4:00 AM. I guess they were trying to get to work ahead of traffic. Suddenly I saw blue flashing lights and red tail lights a mile or so ahead of me. As I came to a stop traffic was trying to get to the right lane. When I got close enough a police officer had his car blocking the road and was routing traffic off the interstate. I followed my GPS and some 18 wheelers through a couple of small towns to the next exit, about 10 miles north, where we got back on the interstate. That added over 30 minutes to my trip. I found out later there was a wreck with fatalities and the interstate was blocked for a long time. I am glad I was able to exit before the accident site. I met Matt and we started fishing at daylight, casting topwater baits in a shallow cove. Matt caught a solid 2.5 pound largemouth on a topwater frog. The second place we stopped I caught 1.5 pound spot on a topwater plug back in a creek. Topwater fishing is fun and the strike is the most exciting one to me. After fishing two more shallow areas to put on the map we started hitting main lake points, using topwater baits and drop shot worms to try to catch some spotted bass. Those points are usually good but there was no wind and no power was being generated, so there was no current. That made fishing tough! On one of the holes, marked #3 on the map but actually the last one we fished, we both caught keeper spots on drop shot worms. But that was it for the day. I was in the car headed home by 10:30, which was great since it got me off the water before it got too hot. The trip home was uneventful although the traffic was much heavier. But there were not wrecks so I was at home and napping shortly after 2:00PM. This entry was posted in Bass Fishing, How To Fish, Where To Fish on February 15, 2019 by ronniegarrison. Based on a couple of trips in November, fish are biting on the Alabama River and Clarks Hill. Based on time of year and weather, they are probably biting everywhere in-between too. I met Peyton McCord and Cole Burdeshaw, two Auburn fishing team members, last Tuesday at Cooters Landing on the river just outside Montgomery to get information for my Alabama Outdoor News Map of the Month article. They won a team trail tournament there the end of September with ten bass weighing just under 30 pounds. They fish the river a lot, know it well, and are very good bass fishermen. The River, as it is called locally, runs from the Lake Jordan dams near Wetumpka north of Montgomery for 80 miles to its lock and dam. It is not well known since it does not get the publicity of other nearby lakes. But it is a fantastic fishery. Coosa spotted bass grow big and fight hard, and the River is full of them. It also has a good population of largemouth. They live in different places, with spots mostly on the main river channel and largemouth back in creeks and coves. Spots love current and live near it. I stayed in Prattville at a Baymont Inn only 10 minutes from the ramp. Although we fished for only a few hours, we caught some nice spots in the 2.5 to three-pound range. Winter is a great time to fish it since spots are more active in colder water. Peyton and Cole caught their fish in September on topwater baits, but that bite is about over since the water is cooler. They switch to jerk baits, crankbaits and a jig and pig for winter fishing. It would be a fun winter trip to the River. There are good places to stay and eat nearby. And the bluff banks and points are easy structure to find and fish when you get on the water. Last Friday I went to my place at Raysville Boat Club on Clarks Hill and fished for three days. On Sunday I met Joshua Rockefeller to get information for my Georgia Outdoor News Map of the Month article. Joshua is a student at Augusta College and on the fishing team. He grew up in nearby Harlem, only four miles from where I grew up in Dearing. We put in at Soap Creek on the Savannah River side of the lake. My place is on the Georgia Little River, only 25 miles away by road but almost 60 miles by water. Clarks Hill is a big lake and I know little about that side of it since I have not fished it much. The pattern Joshua showed me is fishing ditches, creek and ditch channels back in creeks. Bass move back in them as the water gets colder and he told me about the numbers and big fish he had caught out of them in the past few years. The water was 65 degrees, about the same as it was on the Alabama River. We caught a lot of small keeper largemouth and a few small spots, but the bigger fish have not moved back yet. They will as soon as the water gets down to around 60 degrees. Joshua fishes jigs, crankbaits and a sled, a jig head with a flat head that makes it stand up and raise the trailer to mimic baitfish feeding on the bottom. I caught several keepers on a Carolina Rig and shaky head, but he landed about twice as many as I did. This entry was posted in Bass Fishing, Where To Fish on February 11, 2019 by ronniegarrison. Bass are biting, if you do the right thing. A couple of trips in the past week proved my point that some people can catch bass, even on the worse possible conditions. On days I think they are just not biting because of one of my excuses for not catching fish, some are catching fish. For years folks called Lake Allatoona “The Dead Sea!” After a trip a week ago, I won’t ever call it that again. I had a great trip with Carter Koza and his father Jamie Koza, owner of The Dugout, getting information for my February Georgia Outdoor News Magazine https://www.facebook.com/GeorgiaOutdoorNews/ Map of the Month article. Carter caught nine keepers in half day fishing, from 7:30 to 12:30, including a two-pound largemouth and two spots about three pounds each. All hit a Spro Rock Crawler 50 on rocks, the pattern for the article. It was what I consider the worst weather conditions possible for catching fish, first day of a strong cold front. Bright sunny skies. Windy, but that is usually a good thing. The water was very stained, but Carter said that makes for the best winter fishing at Allatoona – cold muddy water is a good thing there! Carter is a sophomore in high school. Younger fishermen like him amaze me with their skills and knowledge. Cater had a great mentor in his father, and he learned well. He explained patterns, what the bass were doing and eating, and why he chose the bait he used, as well as any pro. His knowledge is better than mine even though I have been tournament fishing for almost 50 years!! I would like to fish Allatoona more often, but its location up I-75 north of Atlanta means ridiculous traffic, especially pulling a boat. I avoid going inside I-285 whenever possible. Traffic is bad on I-285, but there are fewer bad merging places. The absolutely worse place, unless there is a wreck, is coming south on I-75 where it merges with I-85. I hate pulling a boat through there anytime since you have to change several lanes fairly fast to avoid exit only lanes, and with thick traffic it is dangerous with a boat. 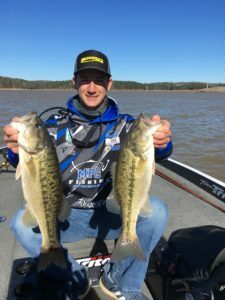 This entry was posted in Bass Fishing, How To, Where To Fish on January 25, 2019 by ronniegarrison. Fall is a great time to be in Upstate New York. The cool breezes are blowing off the giant lakes, the leaves are turning, and the yard-long salmon and steelhead are pushing out of the open water and up into the tributary rivers where they provide some amazing action and draw some amazing crowds. If that’s not enough, 40-inch muskies are coming out of their summer doldrums, and smallmouth bass are stuffing themselves into football proportions prior to getting iced in for the winter. I had the opportunity to make a brief tour through the area thanks to an invitation from the Western New York Regional Development Council and Buffalo-based Hart Hotels to take a look at a public/private partnership being touted as a way to bring economic development, including recreational fishing and boating jobs as well as tourism, to the less-developed areas of the state. Over a week’s visit, we toured three prime fishing/tourism locations. Today, we have a look at Watkins Glen and the Seneca Lake region, southwest of Syracuse. Watkins Glen, located on the south end of Seneca Lake, is part of the Finger Lake Country, a bear-claw scratch deep into the rolling hardwood terrain. There are lakes everywhere in this country, and most of them are stiff with fish. I met with guide Mark Moskal here, who operates not only a guide service but also a kayak rental operation on Seneca. 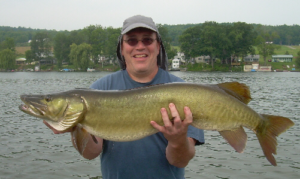 Moskal works not only Seneca but also Cuyuga, Owasco, Waneta and Keuka lakes and the streams that feed them, depending on what’s biting where. He said one of his favorite fisheries occurs in October when Atlantic salmon and lunker browns run out of Cuyuga Lake into the Fall River, offering fly-rodders a shot at athletic, leg-long fish in some of the prettiest surroundings of the area, including a 100-foot waterfall that terminates their upstream journey just below the campus of Cornell University. Muskie fishing is also impressive here—many anglers have fished for them for years without putting one in the boat, but Moskal says if you visit at prime time—late fall—on Lake Waneta, a heavily stocked 3-mile-long impoundment just west of town, you’re highly likely to get at least one fish in for a hero photo, and many are better than 40 inches long, a few over 50 inches. He said trolling is also the preferred tactic for lakers in Seneca, which typically hang at 70 feet and more and are reached via downrigger gear–the fish average 5 to 8 pounds, but 15 pounders are possible. For more, contact Mark Moskal at www.summittostream.com. Watkins Glen Harbor Hotel here is a big part of bringing not only anglers and boaters but travelers of all interests to the Finger Lakes. The upscale 104-room hostelry, recently voted one of the top waterfront hotels in the nation by USA Today, sits at the southern tip of Lake Seneca, with al fresco dining overlooking the city harbor. It’s got all the usual amenities including an exercise room, indoor pool and a business center where road warriors will appreciate the jumbo iMac all-in-one computers. Watkins Glen Harbor Hotel is the result of a public/private partnership that helped bring the upscale facility to a small upstate town where jobs are at a premium. The result is a great spot for anglers, boaters and tourists to hang their hat, as well as a big boost for the local economy. The world-class (but pricey) Blue Pointe Restaurant offers an impressive variety–as an old waterfowler, I enjoyed the duck with andouille sausage risotto. The miso glazed salmon was also particularly good, all washed down with some good wine that not too long ago had been inside grapes growing on the surrounding hills—the area is famed as wine country. The hotel is within walking distance of Mark Moskal’s kayak operation, where you can rent a ‘yak to get out on the lake and have a really good shot at catching some quality smallmouths over 18 inches long, particularly during the spring spawn in May and early June when they move to the flats along the shorelines—soft plastic tubes are one of the favorite lures. It’s also within a couple long casts of the Barge Canal, which leads spawning steelhead right into Catherine Creek in late March and early April. You can access the creek directly from State Route 14, which runs alongside it south of town for miles. Salmon egg imitations, and the real thing, do most of the damage. It’s just over a half-mile stroll from spectacular Watkins Glen State Park, a must-see in this area, with 19 waterfalls over its 2-mile, 400-foot plunge through a gorge down to lake level. The hotel also puts on a jumbo Ice Bar event fund raiser each winter—they carve an entire bar out of block ice, set up on the hotel patio—given the late January date of the event, thawing is not a problem—bring your long johns. Watkins Glen International Raceway is worth a visit if you’re an auto racing fan—many classic races have taken place here over decades. You can actually drive the family vehicle for a few hot laps on the track for a fee—I didn’t think my Pathfinder or my driving skills were up to it. The western shore of Seneca has one of the densest wine tasting operations in the country—there are about 30 wineries and breweries with tasting facilities on the east shore, over 20 more on the west side, in the 30 plus miles from Watkins Glen to Geneva on the Lake, at the north end. Every winery has a half-dozen or more vintages they will insist you try—YOU NEED A DESIGNATED DRIVER. But that said, it’s a pleasant way to while away a rainy afternoon when you can’t fish—tasting fee is about $6 for a variety of “flights”, and most throw in some great local cheeses, as well. Learn more here: www.senecalakewine.com. This entry was posted in Where To Fish on January 9, 2019 by ronniegarrison.